Built in the early twentieth century, its 100-year-old architecture reflects Cottage Grove&apos;s rich gold mining history and success as an early center of commerce. The railroad arrived in the 1870s and helped spur development. Timber and agriculture have also been important local industries. The Cottage Grove Armory was constructed in 1931 to house the National Guard. This distinctive Art Deco building has its own local lore and has even attracted ghost hunters. In the 1940s the army corp of engineers built two dams which created Cottage Grove and Dorena Reservoirs, now popular recreation sites. In 1994, the Cottage Grove Historic Downtown District was added to the National Register of Historic Places, alongside the community&apos;s numerous historic buildings and covered bridges. In the mid 1800s gold was discovered in the Bohemia mountains above Cottage Grove. This led to boom and bust cycles in town as many new businesses hinged on minor&apos;s success. When mining dissipated in the 1920s, the mountains were left pocked with ghost shanty towns and abandoned mines. However, some ongoing mining patents and active claims still remain. Visitors exploring the area are urged to respect private property and to stay out of mines and buildings for personal safety. A better way to delve into the local history is at the Bohemia Gold Mining Museum which sheds light on this fascinating era. And also, every July the Bohemia Mining Days festival celebrates those golden glory days. Cottage Grove has six covered bridges, including the only existing covered railroad bridge in the west. The 1925 Chambers Railroad Bridge was restored in 2011. One of the most expensive, massive and dramatic train crashes in film history took place in Cottage Grove under the direction of director and actor Buster Keaton in 1926. Despite the films&apos; mediocre reception, today this silent, black and white classic is heralded as one of the greatest films ever made. 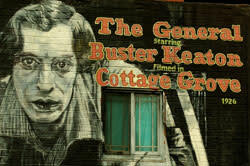 Visit the former Bartell Hotel (now a restaurant and bottle shop) where Buster Keaton stayed while filming "The General." A film industry favorite, Cottage Grove has also been a backdrop in scenes from Buster Keaton&apos;s "Emperor of the North" (1973), "Lost in the Stars" (1974), "Animal House" (1978), "Stand By Me" (1985), "Without Limits" (1996), "Ricochet River" (1997), "The Sisters" (2004) and "Zerophilia" (2004). Remember the parade scene in "Animal House"? That scene was filmed along Main Street. And flashback to "Stand By Me" with a walk along the railroad trestle. Born in 1897 and raised in the logging camps near Cottage Grove, Opal Whiteley was purported to be a child prodigy by some, a fraud by others. She loved nature and was extremely knowledgeable about plants and animals. She attended the University of Oregon in 1916 and supported herself by lecturing on the local flora and fauna, developing a reputation both as an academic and a mystic. 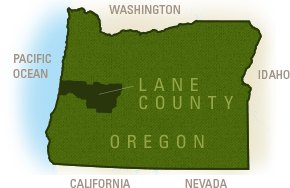 She claimed to be of royal European descent and adopted by her Oregon parents, but this was disputed by her family. Opal rose to fame in 1920 when excerpts from her childhood diary were first serialized in the Atlantic Monthly, and then published as "The Story of Opal: The Journal of an Understanding Heart." The observations written in her childish prose seemed far above the years she claimed and the diary&apos;s authenticity was challenged. References to mistreatment at the hands of her mother within the diary&apos;s pages led to Opal&apos;s estrangement from her family. Disgraced in the ensuing debate, her family changed their name and moved away and Opal fled to Europe to validate her story. In 1948, found destitute and starving, she was checked into a British psychiatric hospital where she remained until her death February 16, 1992. In the 80s, Oregon author Benjamin Hoff, "The Tao of Pooh," won the American Book Award for his research and defense of Opal&apos;s diary in his book "The Singing Creek Where the Willows: The Rediscovered Diary of Opal Whiteley." 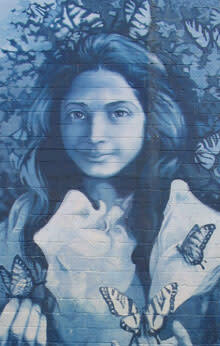 Opal and her tragic life odyssey is immortalized in an iconic mural in downtown Cottage Grove. 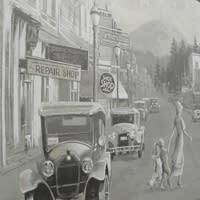 The Cottage Grove Historical Society offers a self-guided tour of her memories around the town.